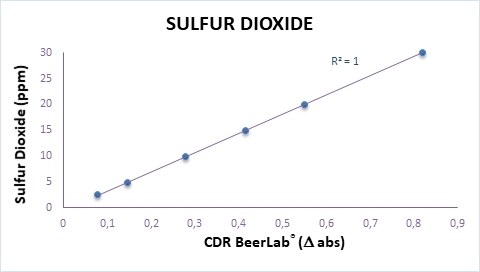 CDR BeerLab® allows to determine Total sulfur dioxide (SO2) in beer giving the result in 1 minute, avoiding the time consuming distillation of the EBC reference method and the using of dangerous and cancerogenic compounds used by AOCS reference method. You can use CDR BeerLab® method easily in the QC lab or even at production line. SO2 is naturally produced in the fermentation steps of beer production. Given its antioxidant capacity it allows to extend the shelf life of the beer itself . The legal limit is 10 mg/L. Total SO2 reacts with a specific cromogen forming a compound used to follow the reaction itself. The end point of the reaction is read at 430nm and the increasing of absorbance is proportional to the total SO2 concentration. Total sulfur dioxide was last modified: February 19th, 2019 by CDR s.r.l.